For many marketers, a Facebook event listing is the workhorse of event promotion. It takes a matter of minutes to create, can easily by shared with hundreds of people, and allows marketers to gauge interest around an event or activity. Marketers post updates for attendees and even change the time and location as needed. However, Facebook might not be as effective as you think at getting your event out there. Some studies have found that medium-sized pages are likely to reach only about 12% of their fanbases, while organizations with a large following might only reach 2-4% of people at a time. While you think you’re reaching your vast fanbase, your event is likely only getting in front of a few select people. Facebook isn’t the only tool out there for event marketing. Check out these six ways you can promote your event through strategic digital marketing. If you’re trying to drive traffic to your website or an Eventbrite page to sell tickets, use your email list to convert people and sell tickets early on. Emails in the events industry have an average 20.41% open rate and 2.19% bounce rate. Compare this to the Facebook reach statistics mentioned above, there small brands are happy to reach 12% of their fans. By sending an email to a list of the same size, you are likely to reach double the people as on social media. Email marketing also gives you the power to offer exclusive deals. While anyone can see your Facebook events, only dedicated fans can see your email content. Sweeten the deal with ticket discounts, early access, and other perks to drive tickets sales and build the buzz around your event. Along with using email marketing to promote your event, you can tap into your text list to get the attention of fans and encourage them to buy tickets or RSVP. Text marketing is incredibly effective because of its opt-in nature. Your audience must actively tell you that they want to receive your updates for you to grow your text list. Once you start to grow your list, you will likely see some impressive results. Text message marketing has an average open rate of 98%. While that doesn’t mean 98% of respondents will take action, you can get your event in front of a larger part of your audience than through email or Facebook. Add your event to our calendar. We have city-specific area sites that target active audiences. We get your event in front of the people who want to see it. Feature your event in our email newsletter. MyArea sends out emails listings of events to our extensive marketing list. Make sure your event is included! Feature your event in one of our guides. We periodically create event guides with the top events of our area. If your event is interesting, we might feature it. As you can see, it’s possible to promote your event in multiple ways through MyArea Network. You can double or triple your reach beyond your Facebook audience just by asking about our programs. Contact us today to see how we can help you create a buzz around your event. 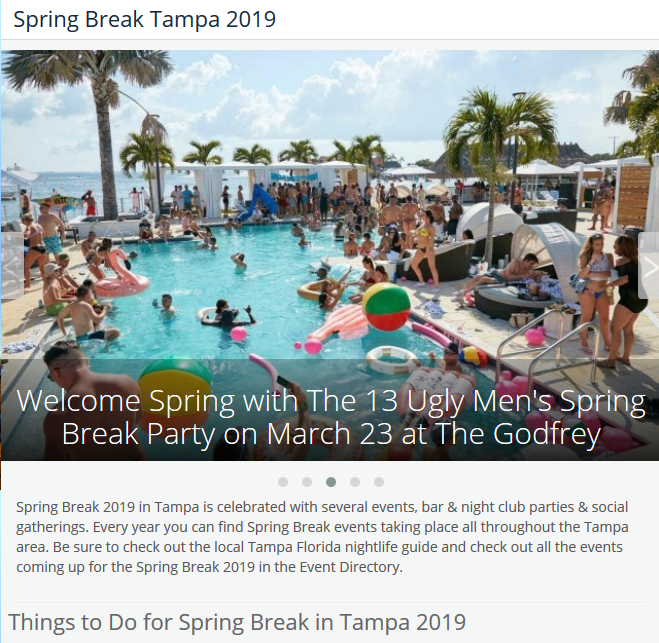 Along with MyArea Network’s listings, there are dozens of community calendars where you can list your event for free and promote it to fans in the area. Check your local newspaper to see if they have local listings, along with regional blogs and news sites. As you grow your community calendar list, you can quickly share your event on multiple pages in the course of an hour. You can also track which community calendars are effective for driving people to your event and which ones don’t generate a lot of buzz. Some local news channels will actually feature certain events found on their community calendars. The more buzz around your event, the more you’re likely to get a free shout out. The Fyre Festival fiasco taught us a million ways to not run an event, but it did teach us about the power of social media buzz. Tap into your inner Billy McFarland and get attendees talking about your event! Create a designated hashtag for your branded event and make sure it’s on all of your promotional items. Encourage guests to post about buying tickets and making plans in the days leading up to it. As a brand manager, you can tease out the event with your own posts, building up the buzz. If you’re really promotion-savvy, you can work with some local influencers to post about your event beforehand. This builds excitement around it and helps you reach new audiences. Social media influencers aren’t just people in your area. They can also be organizations and community clubs that have a large group of active members. Make a list of groups who would be interested in your event and ask them to share it with their members. This could be a meetup group, a local fitness club, a religious organization, or any other collection of people who gather together because of a specific reason. Sharing with these groups provides the benefits of influencer marketing and community calendar posting in one. As you can see, there is so much more you can do to promote your event than to just share it on Facebook. While your Facebook fans might be active, there are still thousands of other people in the community who you haven’t reached yet. If you want to get your event marketing a boost to drive more people to your concerts, meetings, and educational training seminars, reach out to MyArea Network. We have experience promoting both large city and small local events and can help you develop a strategy to improve your event marketing. Or, click below to learn more about our event marketing packages.